Not every seller qualifies for a short sale, and not every underwater home is a strong candidate for a short sale. Take Maria's home, for example. Maria bought a home in Sacramento in 2005, and she put down more than $100,000 in cash. She made a few minor improvements and updated the kitchen. Due to a declining market, the fallout from subprime loans and climbing interest rates, Maria can't sell for her home for the amount she owes, meaning her home is underwater. Does Maria qualify for a short sale? First, she has no financial hardship. She just has a home with negative equity. Second, short sales affect credit and Maria doesn't want her credit rating to be affected or her FICO scores to fall. Third, Maria wants to buy another home. She feels that her neighborhood has deteriorated over the years and, as a single woman homebuyer, Maria no longer feels safe there. So, what other options are available for her? A strategic short sale is a short sale without a hardship. It's planned, calculated and approved by the short sale bank, sometimes in exchange for a big cash incentive paid to the bank by the seller, but that is rare to see and cash payments never happen in California, due to Civil Code 580e. A strategic short sale might be an alternative for a seller like Maria with an underwater home. For example, if Maria rented out her underwater home, she would receive about $1,500 a month. Her mortgage payment, plus taxes and insurance amount to $2,200 per month. Not counting vacancy factors, maintenance or unexpected repairs, Maria would pay $700 a month to support her underwater home as a rental. Over 10 years, that's $84,000. At the end of 10 years, Maria might not yet have reestablished any equity, keeping her in the red. If Maria offers anything less than $84,000 to the bank to release her from her loan and the bank accepts that offer, Maria could very well be ahead of the game. Apart from the time-value-of-money, Maria might not have to sell her underwater home to strike a deal with the bank. In some parts of the country, cash payments are accepted by mortgage lenders. Further, not every strategic short sale involves a cash payment or any kind. Some lenders look the other way regarding assets and consider general guidelines only. As long as the banks receive documentation as required, they will approve the short sale. Personally, I don't believe a deed-in-lieu option is much better than a foreclosure except that it shortens the time period for waiting to buy another home by about a year. A deed-in-lieu tends to favor the bank and not the homeowner. 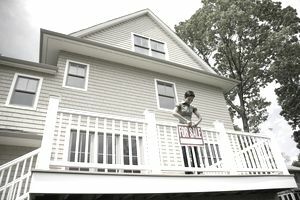 The main reason to give a deed-in-lieu is to end the situation, but it might not be in the homeowner's best interest because some short sales offer cash to the homeowner. If a homeowner owns other property free and clear, the bank might agree to swap the security for the mortgage from the underwater home to the home without a mortgage. By switching out the security for the loan, the homeowner might be able to sell the underwater home at a reasonable price without a loan in place. You might ask yourself who would want to buy a home that is underwater, but there are people who buy underwater homes every single day. These homeowners opt into loan modifications. Maria might be able to sell on a land contract or a lease option sale to a buyer strapped for cash but able to afford the monthly payments. It's buying hope and time for a rebound.